Have you been victimized or duped by a firm claiming to offer mortgage modification services or loan lenders? It is an awful and irritating situation, and the solution is not to whine over it. If you have been scammed by some of the companies offering fake loan or mortgage modification services, then you need professional help on how to go about it as to recover your money, how to get real and credible mortgage modification services, as well as juicy tips on mortgage or loan management services. US legal network is an organization that brings to you professionalism, skill, and expertise on how to get around a scam mortgage loan modification scheme or loan lender. This is through credible and practical education on mortgage modification services and education. What’s more, the education for homeowners who have fallen victims of mortgage modification or loan malpractices is offered for free! US legal network has a professional team made up of qualified, certified, and experienced legal experts who are specialists in the lending services industry. With the help of these professionals, you will be able to retrace and get back your money if your have been duped by a fake mortgage modification company. In addition, if you have been made to sign loan papers that you have not gone through to determine their content, then don’t worry, with the help of our legal professional team, you will be able to work out a working solution. In addition to mortgage modification services and loan scams, we have a rich menu of other services that come in handy in managing your mortgage. For example, one of the main reasons why most homeowners opt for mortgage modification is to avoid an impending foreclosure, and with the pressure and stress that comes with foreclosure, these scam mortgage modification services take advantage of the vulnerable homeowners. After dealing with the fake modification scheme, you will need to deal with the forthcoming foreclosure therefore; the company offers dependable foreclosure solutions as well as authentic mortgage and loan management skills. NOTE: This is a free service. 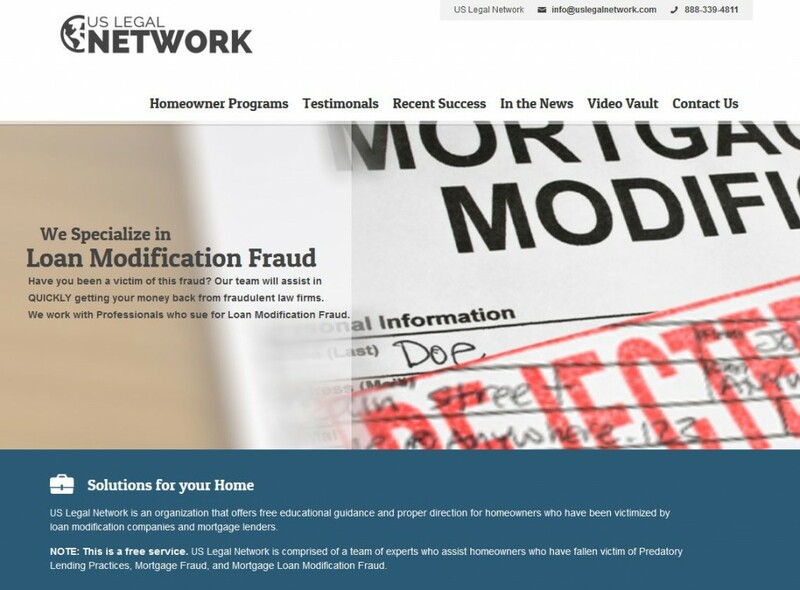 US Legal Network is comprised of a team of experts who assist homeowners who have fallen victim of Predatory Lending Practices, Mortgage Fraud, and Mortgage Loan Modification Fraud. Call today US Legal Network 888-339-4811! © 2019 US Legal Newtork All Rights Reserved.